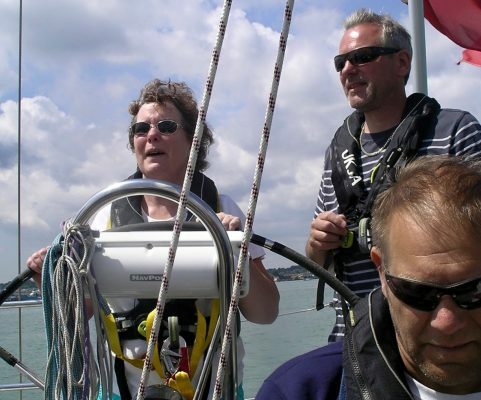 It’s great when we meet experienced sailors, remember we meet Blind and Visually Impaired sailors as well as sighted ones, and we all know what happens every time we get on a boat? We learn something new! If you’ve got no experience don’t worry, you’ll be learning from the moment you step aboard. How’s this for a challenge for the sighted sailor? you’ve just got your day skipper ticket and you want to start taking charge of a yacht, it’s always a bit ‘squeaky bum’ time on that first trip, the shift from crew to skipper is a big one, so good luck. Did you know we at Visa-gb can help any aspiring skipper learn their trade, how’s that we hear you ask? Well imagine you’ve done a couple of trips but now you are about to set off with a new group of experienced sailors – fantastic, makes a change from trying to get your mates to do what you tell them. You sling your kit aboard a Visa-gb boat and get ready to meet the crew, they certainly know their way around and can clearly do everything needed but hang on a second they’re all visually impaired so how’s this going to work?Simple – it’ll work fine and here’s why, as the skipper you’re not going to have to do anything other than facilitate the setting up of the boat and getting underway – you’ll have completed your safety briefing and boat familiarisation so it’s time to go. You’ll need to develop your communication skills to make sure the crew understand the order you want things done, you’ll be concise to make sure each person knows exactly what job to perform and when, you will be managing every aspect but not doing it yourself. Believe us when we say you’ll not get training like this anywhere else and we guarantee you be a better skipper than when you arrived! And by the way they’ll be an experienced Visa skipper in the background so you can bounce ideas, double check and know you’ve got someone watching your back.